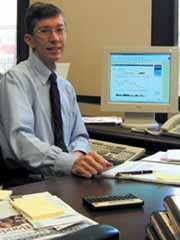 Jay R. Ritter is widely regarded as the world’s leading academic expert on initial public offerings of common stock. “Mr. IPO” is the Joseph Cordell Eminent Scholar in the Department of Finance at the University of Florida. Ritter is best known for his articles concerning equity issuance, including “The Long-Run Performance of Initial Public Offerings” in the Journal of Finance during 1991. His articles are widely cited in both academic journals and the financial press. In recent years, he has been quoted about once per week in such publications as the Wall Street Journal, the New York Times, Business Week and the Economist. Recently, Ritter has been focusing on the role of Wall Street analysts during the tech stock bubble of the late 1990s. His current research incorporates the use of psychological models in explaining stock price behavior. In 2001, Ritter received the Distinguished Scholar Award from the Southern Finance Association. Ritter holds a Ph.D. in economics and finance from the University of Chicago, where he studied under six Nobel Prize winners. He has served as a director of the American Finance Association and is an associate editor of five journals. In 1992 and 2000, Ritter won MBA Elective Teacher of the Year Awards. He teaches in the undergraduate, traditional and executive MBA, and doctoral programs.